With the Body Monitor software you can acquire and analyze physiological data in an easy and user friendly way. It is a state of the art tool that offers all you need to work online or offline with acquired data. It can be used with various hardware interfaces. It is down- and upgradable. The software can acquire an unlimited number of channels and all channels are recorded with the sampling rate the connected hardware interface works with. Zoom and scrolling functions (single channel or linked channels) are of course available. All data and graphs can be exported in various file formats (Data: CSV, XLS, XML; Graphs: BMP, WMF). The Body Monitor software is network capable. It can be used to acquire data from several physiological hardware interfaces that are connected to other computers in a network. Thus it is very easy to acquire and analyze data of various locations on one single computer. 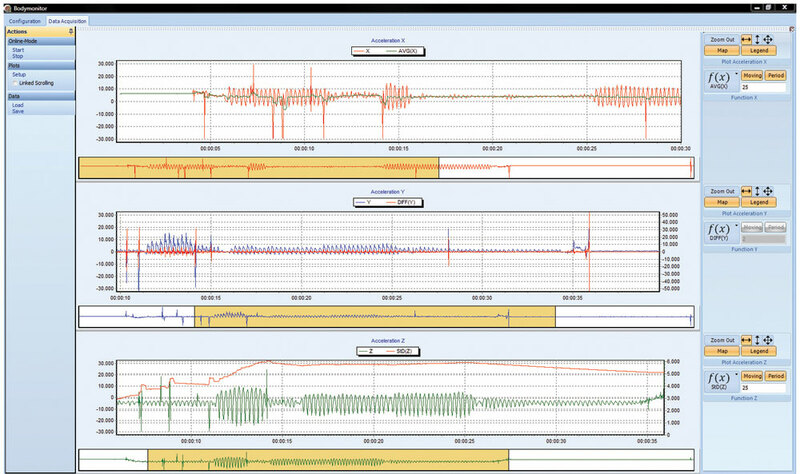 The Body Monitor is a stand alone software for physiological data acquisition and analysis, but it can also be used as an integrated component of our observational data acquisition solution Spectator to combine the physiological data with other observational data.